Myocardial contusion injury (MCI) is a complication of blunt thoracic trauma, which may occur at relatively low velocities. MCI may also occur from chest compressions during cardiopulmonary resuscitation. We review the clinical pathology, diagnostic tools, and treatment for MCI. Blunt thoracic trauma represents 25% of all traumatic fatalities and is commonly associated with work related injuries and motor vehicle accidents.1 In a study of 525 fatalities associated with construction workers in North Carolina between 1978 and 1994, 27% were due to deceleration injuries associated with falls.2 During 2000, there were 6 356 000 motor vehicle related accidents in the USA,3 40% of which were associated with blunt thoracic trauma. Myocardial contusion injury (MCI) is a complication of blunt thoracic trauma. Minimal force is required for a deceleration type contusion injury, and may occur with a body moving at a relatively low velocity of 20 miles/hour.1 Patients may also acquire a MCI from chest compressions during cardiopulmonary resuscitation.1,2 The incidence of MCI among blunt chest trauma victims ranges from 0% to 76% depending on whether a diagnosis was made clinically or at post-mortem.1,4–8 The difficulty in making a definitive diagnosis of MCI in the acute trauma situation is due to the injury being definitively diagnosed by the presence of necrotic myocardial cells, histological changes that can only be seen during an autopsy. Hence, physicians must rely on various diagnostic tests to arrive at a diagnosis of MCI.9–11 Currently, the methods used in the assessment of blunt chest trauma include medical history and physical examination, plain chest radiography, electrocardiography (ECG), cardiac markers, echocardiography, and nuclear imaging (table 1). The purpose of this paper is to review the current literature on MCI and to present an algorithm for the management of patients presenting to the emergency department with blunt chest trauma and possible MCI. Regardless of the mode of blunt cardiac trauma, the myocardium becomes injured when the impact applies pressure to the heart within the thoracic cavity. The myocardium may also sustain damage from impact against adjacent bony structures such as the sternum or vertebrae, or by shearing stress forces caused by a sudden increase in the intrathoracic pressure.12,13 The cardiac insult induces histological changes that are characteristic of and diagnostic for MCI. At the cellular level, myocardial muscle fibres become necrotic, and red blood cells permeate into the myocardial tissue.12 These changes may not be visible on gross examination of the heart. The epicardial surface may demonstrate changes suggestive of a small area of haemorrhage, although there may be extensive haemorrhage, necrotic cells, and polymorphonuclear leucocytes extending intramurally or transmurally.12 As a result of the cellular damage, the myocardial cells leak creatinine phosphokinase (CPK) into the circulation. During the healing process, the haemorrhage is absorbed gradually in a patchy, irregular pattern with subsequent scar formation. The most common patient complaint in MCI is precordial pain unrelieved by analgesia, which may mimic symptoms of angina or acute myocardial infarction.14,17 Patients may also present without symptoms or signs of external trauma or fractures. These symptoms may become obscured by other injuries sustained during the traumatic event.14,17 The most common associated thoracic injuries are rib fractures, pulmonary contusions, pneumothorax, haemothorax, flail chest, sternal fractures, and injury to the great vessels.18 Approximately 75% of patients diagnosed with MCI present with external thoracic trauma.17,19 Patients with cardiac tamponade may have muffled heart tones, pulsus paradoxus, elevated venous pressure, bulging neck veins, and signs of shock. Patients with acute valve or cord rupture may present with new onset murmurs or thrills, and with haemodynamic instability.12 MCI should be suspected in the presence of a pericardial friction rub, S3 gallop rhythm, pulmonary rales, or an elevated central venous pressure.1 Owing to this variability in patient presentation and clinical sequelae, the detection, diagnosis, and management of MCI is challenging. CPK is released as a result of cellular damage to myocardial and skeletal muscle, kidney, brain, and liver.12 CPK myocardial band (CPK-MB) is specific for myocardial and skeletal muscle trauma, and is a particularly good marker of cellular injury because it increases and peaks in the first 24 hours and decreases to normal levels within 72 hours. Levels of CPK-MB >5% of the total CPK are considered abnormal.1,12 CPK-MB levels are usually elevated in trauma patients because of multiple injuries. However, the source of the enzyme may be due to non-myocardial sources, making CPK-MB a non-specific marker of cell injury. There are also conditions in which CPK-MB may be falsely elevated. These include tachyarrhythmias, diaphragm injury, Duchenne’s muscular dystrophy, gas gangrene, Reye’s syndrome, idiopathic myoglobinaemia, Rocky Mountain spotted fever, exercise, muscle inflammation, and tongue trauma.3,12,20–22 Furthermore, false positive elevations may also be seen if the total CPK is >20 000 units, which often occurs in massive skeletal muscle injuries.17,22,23 Calculating the ratio of CPK-MB to total CPK improves specificity, but sensitivity declines if patients have both cardiac and skeletal muscle injury.20,22 Therefore, measurement of CPK and CPK-MB is not useful in the diagnosis and management of MCI. Cardiac troponins (troponin I + T) are a more specific marker for myocardial cellular injury compared with CPK-MB because they are only released after disruption of myocardial cell membranes. Cardiac troponins remain in the plasma for 4–7 days.3,22,24,25 Ferghali et al1 reviewed 128 patients who had suffered blunt trauma and concluded that circulating cardiac troponin I (cTnI) was not an accurate tool for the diagnosis of myocardial contusion. The main disadvantage of troponin T was its low sensitivity rather than low specificity. However, Adams et al22 studied 44 patients admitted for blunt thoracic trauma and found that six patients with confirmed MCI and wall motion abnormalities on echocardiography had increased cTnI. Furthermore, 70% of patients who did not have a MCI as confirmed by echocardiography had elevated CPK-MB but no increase in cTnI. They concluded that cTnI is a specific marker for myocardial injury. Furthermore, two recent studies, by Mori et al26 and Collins et al,27 have highlighted the usefulness of serum tropin levels in evaluating cardiac injury, suggesting that cTnI is a useful screening test when performed prior to echocardiography following blunt chest trauma. Unfortunately, there is no correlation between the complexity of arrhythmias and the degree of cardiac contusion.1 Studies attempting to correlate ECG with cardiac complications are inconclusive.1 Maenza et al16 found that abnormal ECG and abnormal CPK-MB are linked with clinically significant complications requiring treatment. Although patients with suspected cardiac contusion injuries may present with varying arrhythmias, certain studies have stressed the importance of considering non-cardiac sources or previous heart disease as causes of ECG abnormalities. Sousa et al30 concluded that many ECG abnormalities may be due to pain, anxiety, haemorrhage, hypoxia, hypokalaemia, head trauma, alcohol intoxication, or cocaine use. Other conditions, such as lung contusion, hypovolaemia, abnormal arterial blood gas, elevated catecholamine states, pre-existing heart disease, altered serum electrolytes and pH, and changes in vagal tone may also contribute to an ischemic pattern on ECG. Wisner et al6 conducted a retrospective study examining the total number of patients who underwent transoesophageal echocardiography (TEE) in the trauma ICU or trauma admitting area over a 30 month period. TEE was performed in 81 patients, and 22 were found to have TEE evidence of MCI, defined as the presence of wall motion abnormality, involving either one or both ventricles, in the absence of transmural myocardial infarction on ECG following non-penetrating chest trauma. At their institution, transthoracic echocardiography (TTE) is initially performed on patients with suspected MCI. However, if the study is technically limited, TEE is performed. Of the 22 patients who underwent TEE, seven had had TTE performed initially. Focal right ventricle outflow tract hypokinesis was observed in three patients. This is a difficult area to visualise by TTE but was clearly seen with TEE. ECG was non-diagnostic for cardiac contusions in 73% of patients. In a multicentre prospective trial conducted over a 28 month period, Sousa et al30 studied the usefulness of TOE in patients with blunt chest trauma and compared TOE results with those of ECG and cardiac isoenzyme studies. In total, 117 patients were admitted to the hospital with suspected myocardial contusion after a blunt chest trauma injury, and each patient received a TEE within 72 hours of hospital admission; 56% had pathological findings attributed to blunt cardiac trauma diagnosed by TEE, while in the remaining 44%, TOE was normal. In contrast, the sensitivity and specificity of an abnormal ECG was 59% and 73% and of a high CK-MB and CK-MB/CK >5% was 64% and 52%, respectively. It was concluded from this study that TEE is a preferred method of diagnosing blunt cardiac trauma because of its safety, speed, accuracy, and convenience. Brooks et al31 studied 50 patients in whom a diagnosis of cardiac contusion was considered based on physical findings and cardiac enzymes, and who underwent both TEE and TTE. Segmental wall motion abnormalities were observed in 26 patients with TEE and in only 6 patients with TTE. The authors stated that TEE offered several advantages over the current battery of tests in assessing patients with chest trauma. It is semi-invasive and has been shown to be safe even when evaluating critically ill patients. It can also be performed at the bedside or emergency room, and can be performed while other procedures such as laparotomy are being carried out. A disadvantage was its inability to visualise the entire thoracic aorta, although 90% of traumatic aortic rupture in which the patient survives to reach the hospital occurs in the isthmus of the aorta, which can be visualised by TEE. The major advantage is that a TEE study can either greatly increase or decrease the suspicion of a patient having a thoracic aortic injury. Normal results can give the trauma surgeon time to concentrate elsewhere before sending the patient for definite angiography while a positive result would heighten the need for immediate attention to the thoracic injury. According to Karalis et al,33 TTE provides direct visualisation of cardiac structures and ventricular function, and should be superior to other non-invasive tests in diagnosing myocardial injury. However, TTE has not been correlated well with ECG findings or cardiac enzyme determinations, and has not been shown to predict reliably which patients with blunt chest trauma will develop late cardiac complications. In patients with blunt chest trauma, comparison of TOE with TTE showed that TOE was able to detect myocardial injury that was missed by TTE. In addition, TOE was superior to TTE in visualising thoracic aorta. Using radionucleotide imaging, concentrated areas of 99mTc-pyrophosphate or reduced areas of perfusion may indicate the presence and extent of myocardial damage. However, 99mTc-pyrophosphate scans have high false negative rates,1 and are not recommended for use in diagnosing MCI. Radionuclide ventriculography may reveal reduced ejection fraction and focal defects in the wall motion of the ventricles, particularly in the right ventricle. Thallium or sestamibi imaging is excellent for evaluating perfusion of the left ventricle but is a poor imaging modality for right ventricle perfusion. However, right ventricle contusions are twice as common as left ventricle contusion injuries. MCI should be suspected with reversible findings on radionucleotide angiography.1 Maenza et al16 concluded that radionucleotide scans were unrelated to complications and were not useful in the evaluation of blunt thoracic trauma. Myocardial contusion injury is an important entity that requires rapid recognition and diagnoses. The current approaches at many medical centres have a limited use of cardiac imaging in patients with suspected MCI. The imaging is often delayed until additional supplemental studies such as cardiac enzymes and telemetry monitoring are performed. This may lead to a delay in the diagnosis which may have an adverse outcome. 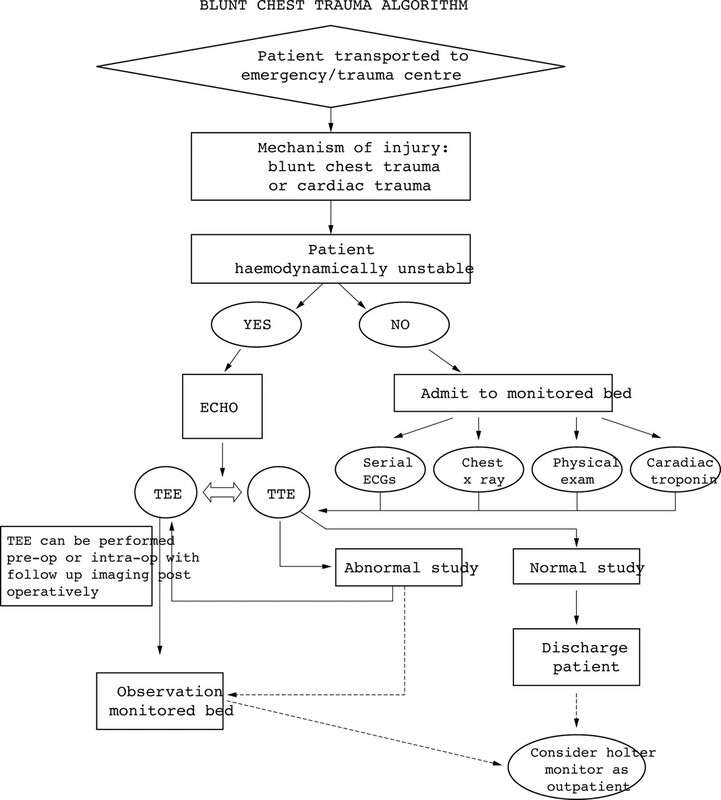 We propose a new algorithm for use in blunt chest trauma and cardiac trauma injury (fig 1). Patients transported to the emergency room or trauma centre after sustaining blunt chest wall trauma or cardiac trauma need to first be assessed clinically and haemodynamically to determine the severity of injury and the appropriate evaluation protocol. If the patient is haemodynamically stable, they should be moved to a monitored bed as on a telemetry floor or observational unit. Many emergency rooms and trauma centres have standard trauma protocols that include an initial chest radiograph, electrocardiogram, basic blood tests, and cardiac enzymes. Serial electrocardiograms, cTnI, or cTnT should be added to standard protocol to monitor changes or progression of injuries. Several centres have examined these specific markers and have found them valuable after comparison to other diagnostic modalities. The echocardiogram can be used to stratify blunt chest trauma patients with or without cardiac disease and to determine the presence of acute or chronic changes. Several studies as summarised previously have shown that TEE is more effective in certain patient groups, particularly those with right ventricle outflow tract lesions (RVOT). Therefore, a TEE should be performed as: (a) follow up after an abnormal initial TTE or (b) further investigation for a questionable lesion not adequately visualised on TEE. If the TTE result is normal and the supporting studies show no abnormalities, then the patient may be discharged after monitoring. These patients should be considered for outpatient Holter monitoring because of increased risk of arrhythmias. There are no corroborating studies suggesting the duration of monitoring and the actual benefit of such an undertaking. The current data illustrate that TOE is a useful screening tool for the evaluation of MCI in the emergency room. We have proposed an algorithm that would be useful in triaging patients who present to the emergency room with potential MCI, allowing for appropriate further evaluation or specific treatment in these patients. Fegheli NT, Prisant LM. Blunt myocardial injury. Chest1995;108:1673–77. Jackson SA. Fatal occupational injuries in North Carolina construction industry, 1978–1994. Appl Occup Environ Hyg2002;17:27–33. Kaye P, O’Sullivan I. Myocardial contusion: emergency investigation and diagnosis. Emerg Med J2002;19:8–10. Dubrow TJ, Mihalka J, Eisenhauer DM, et al. Myocardial contusion in stable patient: what level of care is appropriate? Surgery1989;106:267–74. Frazee RC, Mucha P, Farnell MB, et al. Objective evaluation of blunt cardiac trauma. J Trauma1986;26:510–20. Wisner DH, Reed WH, Riddick RS. Suspected myocardial contusion: triage and indications for monitoring. Ann Surg1990;212:82–6. Leinoff HD. Direct non penetrating injuries of the heart. Ann Intern Med1940;14:653. Sigler LH. Traumatic injury of the heart–incidence of its occurrence in forty-two vases of severe accidental bodily injury. Am Heart J1945;30:459–78. Fildes JJ, Betlej TM, Manglano R, et al. Limiting cardiac evaluation in patients with suspected myocardial contusion. Am Surg September 1995;61:832–5. Fabian TC, Cicala RS, Croce MA, et al. A prospective evaluation of myocardial contusion: Correlation of significant arrhythmias and cardiac output with CPK-MB measurements. J Trauma1991;31:653–60. Sutherland GR, Calvin JE, Driedger AA, et al. Anatomic and cardiopulmonary responses to trauma with associated blunt chest injury. J Trauma1981;21:1–12. Tenzer ML. The spectrum of myocardial contusion: a review. J Trauma1985;25:620–7. Jackson DH, Murphy GW. Nonpenetrating cardiac trauma. Med Concept Cardiovasc Dis1976;45:123–128. Gotlieb AI, Schoen FJ, Silver MD, eds. Cardiovascular pathology. 3rd ed. London: Churchill Livingstone, 2001. Zabaneh RI, Ventataramani A, Zabaneh SS, et al. Blunt chest trauma causing isolated single papillary muscle dysfunction and mitral regurgitation. Chest1993;104:986–87. Maenza RL, Seaberg D, D’Amico F. A meta-analysis of blunt cardiac trauma: ending myocardial confusion. Am J Emerg Med1996;14:237–41. Braunwald E, ed. Braunwald’s heart, 5th ed. Philadelphia: WB Saunders 1997. Snow N. Richardson JD, Flint LM Jr. Myocardial Contusion: Implications for patients with multiple traumatic injuries, Surgery1982;92:744. Potkin RT, Werner JA, Trobaugh GB, et al. Evaluation of non-invasive tests of cardiac damage in suspected cardiac contusion. Circulation1982;66:627–31. Ravel R. Clinical laboratory medicine. 4th ed. Chicago: Year Book Medical Publishers, 1984:231. Adams JE, Davila-Roman VG, Bessey PQ, et al. Improved detection of cardiac contusion with cardiac troponin I. Am Heart J131:308–12. Adams JE, Abendschein DR, Jaffe AS. Biochemical markers of myocardial injury: is MB creatine kinase the choice of the 1990s? Circulation1993;88:750–63. Adams JE, Bodor GS, Davila-Roman VG, et al. Cardiac troponin I: a marker with high specificity for cardiac injury. Circulation1993;88:101–6. Cummins B, Aukland M, Cummins P. Cardiac specific troponin I radioimmunoassay in the diagnosis of acute myocardial infarction. Am Heart Journal1987;113:1333–44. Mori F, Zuppiroli A, Ognibene A, et al. Cardiac contusion in blunt chest trauma: a combined study of transesophageal echocardiography and cardiac tropinin I determination. Italian Heart J2001;2:222–7. Collins JN, Cole FJ, Weireter LJ, et al. The usefulness of serum troponin levels in evaluating cardiac injury. Am Surg2001;67:821–5. Cane RD, Shamroth L. Prolongation of QT interval with myocardial contusion. Heart Lung1978;7:652–6. Blair E, Topuzlu C, Davis JH. Delayed or missed diagnosis in blunt chest trauma. J Trauma1971;11:129–145. Sousa RC, Garcia-Fernandez MA, Moreno M, et al. Value of transesophageal echocardiography in the assessment of blunt chest trauma: correlation with electrocardiogram, heart enzymes, and transthoracic echocardiogram. Rev Port Cardiol1994;11:833–43, 8078. Brooks SW, Young JC, Cmolik B, et al. The use of transesophageal echocardiography in the evaluation of chest trauma. J Trauma1992;32:761–5 discussion 7658. Hiatt JR, Yeatman LA, Child JS. The value of echocardiography in blunt chest trauma. J Trauma1988 Jul 28;7:914–22. Karalis DG, Victor MF, Davis GA, et al. The role of echocardiography in blunt chest trauma: a transthoracic and transesophageal echocardiographic study. J Trauma1994;36:53–8.